Chicken salad is one of those things that can be either completely amazing or kind of scary. We are pretty picky about how our food has been prepared, so we would never order chicken salad from, say, a fast food place or the supermarket (the thought of it makes us cringe). 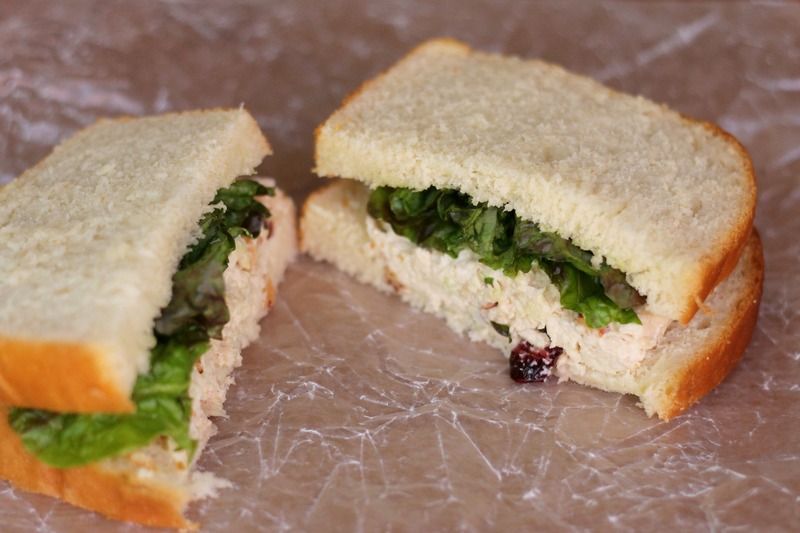 However, we have had the occasional delicious homemade chicken salad, so we decided that we wanted to find our ideal recipe! We’ve found that Cooking Light usually has good recipes for salads, so we decided to look there. When we found this recipe, we knew we would love it immediately. This chicken salad has some Dijon mustard, honey, dried cranberries, chopped smoked almonds, and Greek yogurt in place of some of the mayonnaise. All great ingredients! When we tasted it, it was just as delicious as we expected. It has a slight kick from the almonds and the mustard, but it is still a great classic chicken salad (with a twist). This is definitely an easy recipe that we will be sure to make again! P.S. We ate it as sandwiches on some homemade bread that you do not want to miss on Monday! Combine mayonnaise, Greek yogurt, lemon juice, vinegar, mustard, honey, salt, and pepper, stirring with a whisk until combined. Add the chicken, celery, cranberries, and almonds; toss well to coat. Serve on bread, crackers, salad greens, etc. Enjoy!